Meeting time: is at 7:20 for a 7:30 departure. We run in pace-based groups (see table below). New joiners: We recommend that the first time you run with us that you arrive 5-10 minutes earlier and come inside the foyer to meet us and find out who to run with. Running Safely: the club has agreed guidelines on safe running in groups and in the dark. It is your responsibility to read and note these when you run with the Club. Clothing and equipment: Road runners must wear clothing with Hi-Viz strips or colours during the winter months when we will be running in the dark. Road groups also do some trail running in spring, summer and autumn months, but road or trail shoes are typically fine for the local trail terrain. Abbey Cafe: After the run we normally meet at Holt Park for a cup of tea, coffee and biscuits. 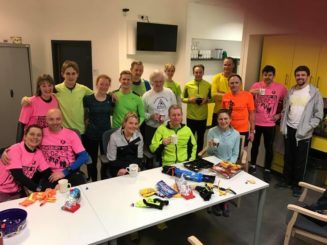 Runner of the Month: Every second Tuesday of the month after training we go to the Lawnswood Arms to celebrate the runner of month – see social page for more details. Groups can set off together and should stay together, meeting at appropriate intervals to allow everyone to catch up. Groups can split part way around a club run provided this is agreed explicitly at a meeting point and groups do not become fragmented or risk losing runners. Groups should be about 6-10 people. If possible split in two if the group is much bigger. All runners to be courteous to other users of Holt Park Active facilities and please ALWAYS leave a gangway to get past us. Faster group members generally know each other anyway and so a fixed meeting point is less critical but it will help if they keep clear of the formation of the less rapid groups so we don’t confuse beginners or runners with less confidence.